I'd also like to bring up bio-luminescence- you could have "night lights" from planets covered with forests of bio-luminescent plants, etc. The problem I foresee with this is that as soon as you dip down to planet level you'd have floating lights attached to nothing.. or just pasted onto the terrain as a texture/shader. Until we have procedural structures (cities/forests/etc..) the lights will look great from afar, but likely very confusing and lackluster close up. Look at the system/shaders/ and in the cache/shaders/. You will be surprized how many shaders are used in SE. Basic shading? Atmosphere, eclipse shadows, complex materials, water, foggy objects, black hole warp effect - all this are impossible with "basic shading". Edit: Reinstalled space engine due to planets not loading at all. and apparently it's only the spaceships that have no secondary shadows. I Didn't notice the shadows on the terrain because it was subtle, in a good way. What we have here is a confusion between the optical term "shading", and the computer term relating to shader code for calculating effects on the graphics hardware. I Didn't notice the shadows on the terrain because it was subtle, in a good way. Those shadows aren't really proper shadows... it's not the landscape of the planet casting them, it's the same sphere used to cast eclipse shadows. there wasn't much confusion actually. when I said basic shading, I meant I thought he was using just opengl. but the shaders files prove he's using GLSL as well, he's just using it more creatively than i could actually think up. Actually, OpenGL can't work without shaders. This was possible 15 years ago. In modern OpenGL you must use shader even to render a single triangle. One alternative is to generate a shadow map. It could be possible with a shader. 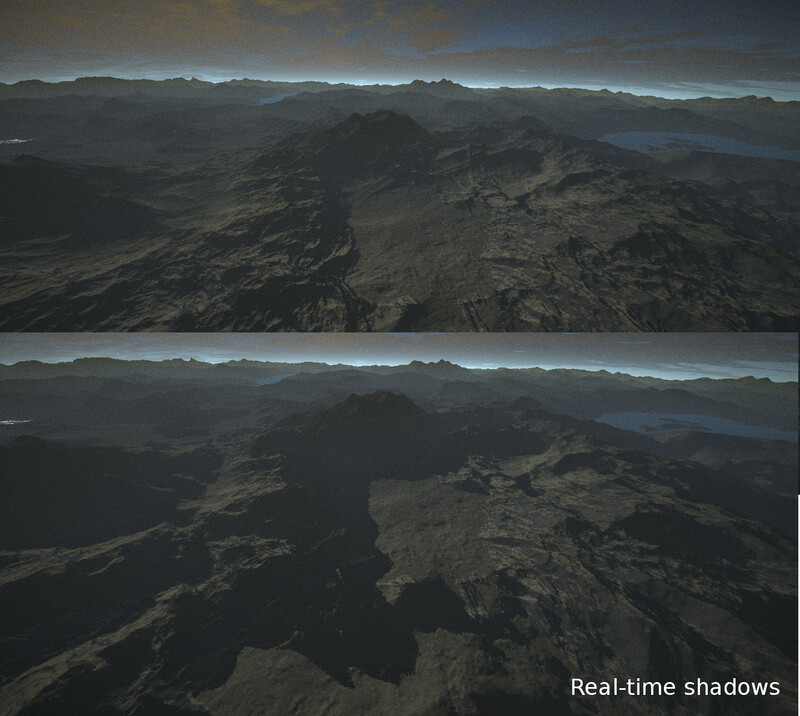 Salvo, I guess that's a real problem, working real time shadows is as resource-consuming as landscape generating. SpaceEngineer, so, I guess, the current lighting system is already very complex and I even noticed some bugs in it. The situation is, some places like brown dwarf systems, may sometimes have as much as 5 light sources - which is an asteroid satellite, a planet, another planet or satellite nearby, a brown dwarf itself and a second component in binary star. With this, the situation is really complex and some bugs may happen, as my observation show me. No, actually, that is not an important issue, they are not really that easy to notice most of the time, unless the major source of light disappears. But with that in mind, any system of real dynamic mapping is out of question. On the other hand, let's return to the asteroids. They are really small, and their surface is considerably curved, so there's always a part of the landscape on terminator, that are really , in the shadow of the mountain, and sun shouldn't be able to reach there, but they are brightly lit and very confusing to observe. Finally, if there's a sunset on the planet, then we have similar problems - even if the sun is lower than local horizon, some surfaces remain quite bright. It looks a bit like the sky itself is shining, but I know that this system is not currently supported. In reality, the landscape at the horizon should obscure most of the light, casting long shadows, but that is not possible to imagine without dynamic lighting. Actually, I want to clarify - it is only a suggestion, it's not like I think that you don't know about this issue, I just want to know your opinion or if you're going to resolve that somehow in the future. Aerospacefag, I guess you mix shadow mapping with lightmaps what is indeed only for static lights. Currently in SE any dynamic object (planet or spaceship) can use up to 4 light sources. As long as SE engine uses forward rendering pipeline, its performance linear depends on number of light sources, so adding new light is a bad idea. When I rewite engine to use deferred rendering, it would be possible to use hundreds of local lights. But number of global lights (sun/moon) will still be limited, because they must use atmospheric scattering effect, what is quite complex and slow (you may notice that airless planets shows better performance). SE also have its own "precise" eclipse shadow technique. Eclipse shadows are calculated directly in the planet's (and ship's!) pixel shaders ad give much more accurate and artefactless shadows (umbra and penumbra!) what shadow maps can give. It will be used together with shadow maps in the future. Shadow maps are still needed for shadows of irregular bodeis like asteroid-like moons. Rings shadows are implemented in similar way - they computed directly in the rendering shader. Future versions will take into account rings from any planet, not only from ring host. Ie Saturn's moons will receive shadows from Saturn rings. About the lava issue, I have found a procedurally generated lava flow that looks simple and also quite realistic. I don't think that qualifies as simple -- that's a five hour rendition made using Blender. Not exactly practical in the real-time rendering system of Space Engine. If you wanted any sort of fluid dynamics in SE you would need to do a system similar to From Dust and that would be difficult to code. Maybe in the far future of SE we will see something close to this. I don't think that qualifies as simple -- that's a five hour rendition made using Blender. Those nightside images of Io look amazing! Could this mean we might have rocky planets that orbit so close to their parent star that the nightside is glowing from seas of molten lava? Or otherwise highly volcanic worlds? Might that even be a new planet class? Io is designated as a selena, but it is neither a selena, icy world or desert. There could be other Ios out there, both from tidal heating and from intense stellar heat. Are we going to see any new planet classes in 0.9.7.2? I remember reading an article about a new class of planets being discovered called Gas Dwarfs, as well as a rocky planet that is more or less a Rock Giant (or Superterra).